You will most probably come across polarisation in everyday life within the realms of photography and the choosing of sunglasses. You may have seen the effect of polarisation on a computer screen - perhaps your teacher has used it for a demo... see the vidclip below. 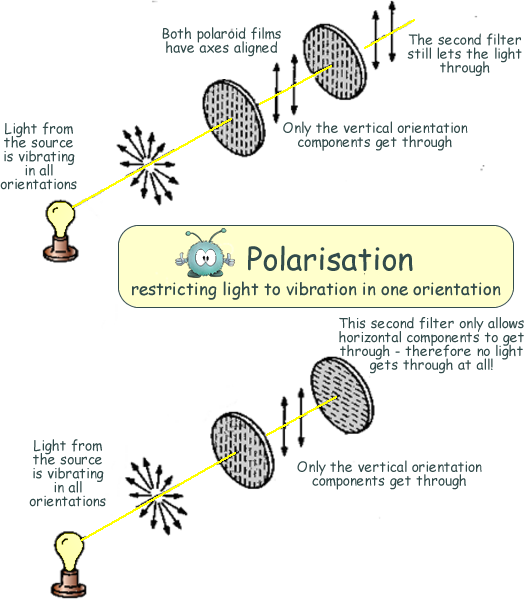 Polarisation is the orientation of vibration perpendicular to the direction of energy travel. It can be measured with a polarimeter. Plane polarisation is the method of allowing only waves orientated in the same direction - only allowing vibrations in one plane. Only transverse waves can be plane polarised because their vibration is perpendicular to the direction of energy travel - you can therefore have this vibration at different orientations. Longitudinal waves cannot be plane polarised because the direction of vibration and direction of propagation are the same.Acoustic waves (sound waves) in a gas or liquid do not have polarisation - but all of the electromagnetic waves do. When electromagnetic waves travel through space they do so at all orientations. The direction of energy movement will be at some angle to the path it is travelling; this is what is called polarisation. Imagine waves travelling along a cord strung between two points; relative to the line of the cord, the waves can go either left and right, or up and down, or at any angle in between. In the first place, this angle - the polarisation of the wave - will simply depend on the angle at which the cord was plucked. However, if the cord passes through a slit then only the waves which are parallel to the slit will get through unhindered; waves which are exactly perpendicular to the slit will be absorbed entirely. Waves at intermediate angles will get through, but the component of their motion which is perpendicular to the slit will be absorbed and the wave that emerges the other side will be of a reduced size, and polarised in line with the slit. Most light sources produce unpolarised light. This is because they contain billions of electrons that are continually being excited and de-excited randomly (in all directions) and therefore producing billions of photons at all of those randon orientations when they return to lower energy levels. When unpolarised light passes through a polarising filter, about half of its energy will be absorbed.The filtering is the result of long polymers in the material, all aligned the same way. These polymer molecules absorb the component of the light with which they are aligned so the light that emerges from the other side will all be polarised in line with the filter. The chance that any single photon will passing through depends on how close its polarisation is to the angle of the polariser - and as the photon orientation is random the absorbtion:transmission will be 50:50. In the diagram the lines on the filters represent a 'grid' that the wave components can get through (in the same way as the rope waves) - they do NOT represent the orientation of the chains of molecules that absorb the waves. When you look at a piece of polaroid film you cannot see any lines on it at all! If you align two polaroid filters and then steadily rotate one of them you will find that less leght gets through until when you have rotated the second filter 90 degrees no light gets through. As you continue to rotate the filter the amound of light getting through the filter combination will increase until you get to the point when the total rotation of the filter is 180 degrees. When in this position you will have the same amount getting through as you had in the first place. Whether a wave undergoes plane polarisation is therefore a test for a transverse wave. This can be done for visible light using two strips of polarisaing film or for microwaves using a 1 cm metal grid. 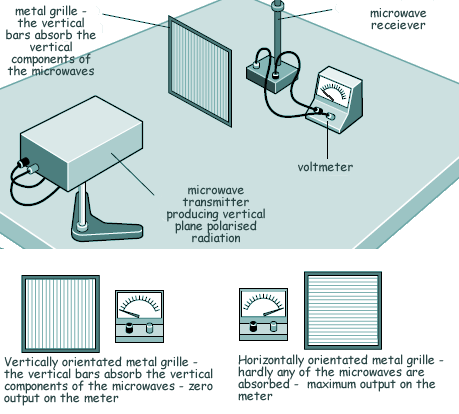 Two grids at right angles to each other will absorb all of the microwaves - hence microwave sources are surrounded by a fine mesh. In order for an aerial to receive plane polarised radiowaves it has to be lined up parallel to the electric component of the electromagnetic wave. It will then absorb the energy as it is used to make electrons in the aerial vibrate - like the 'bars' in the illustration above. Remember an aerial wants to absorb the radiation - not allow it to pass through unimpeded. Light reflecting off water (or any other shiny but non-metallic surface) will be partially polarised; this is because the component of the light which is perpendicular to the surface is inverted by being reflected, and interferes with itself destructively. See polaroid sunglasses. Optically active substances actually rotate the polarisation of light passing through them, while birefringent materials refract light by different amounts depending on its polarisation. An example of this is the mineral calcite, which produces clear double images by splitting the incoming light into two streams with complementary polarisations. Polarising filters in photography. Working on exactly the same principles as polaroid sunglasses, these are very useful for intensifying colour. They darken blue skies, which without them tend to look washed out in landscape shots, and for cutting out unwanted reflections or, should you wish to, you can turn one round 90 degrees and brighten the skies and enhance the reflections. Photos of objects under water when viewed from the surface can be greatly improved - see illustration. Decoration. The effects of birefringence can be absolutely stunning. 3D effects. The lenses of 3D polaroid glasses are aligned at rightangles, so that light which is admitted by one is blocked by the other. Like red/blue or red/green 3D glasses, they work by delivering slightly different views to each eye using filtering, but they have the big advantage that they allow full colour displays.3-D cinema uses this effect.